on or around October 26, 2009. Now it's Ray's turn to rock! 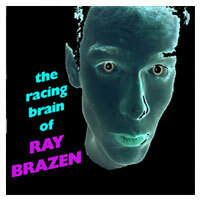 the racing brain of RAY BRAZEN. Click below to access Ray's world-famous online family! RAY'S COLLABORATION WITH R. STEVIE MOORE! With The Money That You Made At The Horse Race"
at his new page at MYSPACE.COM! CLICK HERE FOR BRAZEN MP3S!